Opinion: The Bible Tells Us to Welcome The Stranger, But What of The Caravan? The alternative universes of CNN and Fox News provide alternate facts about the Central American caravan heading north to the United States-Mexico border. It is made up of mothers and children, single men in search of work, criminals, some from the Middle East as well as from Honduras and El Salvador, political organizers, an invading group, and individuals escaping from fear and seeking hope. Take your pick. Neither media source, however, provides a satisfactory way to refer to these migrants as we might relate to them ─ from an institutional perspective or as individuals thinking of their fellow human beings. These migrants are “strangers” since we do not know them. And, these migrants are “refugees” if they claim to be motivated by a credible fear of persecution. Despite these semantic differences, we might ask whether both should be treated in the same way. The Bible tells us to welcome the stranger, but should we also welcome the refugee? Recently, HIAS (originally known as Hebrew Immigrant Aid Society) provided a way to do just that. Its tag line for a National Refugee Shabbat was “Welcome the stranger, Protect the refugee. “The weekend event was celebrated from New York’s Church of St. Paul & St. Andrew to San Diego’s Congregation Beth Israel. As a first step, let us tease our way through how these words work for us. If we were to look up synonyms for stranger (a person who is unfamiliar) and refugee (a person running from something, often oppression), we would not find them in each other’s list of more than 25 equivalents. Two words, though, appear in each set that provide a tenuous link: alien and foreigner. A weak connection, but not an equivalence. Moreover, there is a very different mindset created by our media in understanding this northward bound caravan. A Google search finds over 66,000 references for “Central American refugees,” but zero references for “Central American strangers.” Add the word “caravan” and the results are similar although not as dramatic. Perhaps this is an oversimplification, but the media mindset provides a radical distinction for framing the caravan in terms of refugees versus strangers. A stranger, as a person who is unfamiliar to us, might be someone who is running from oppression. But that is not what we mean when we teach our children about “stranger danger” or that we should not open our doors to strangers, worrying about a home invasion. These are elements of fear while we think of a refugee as someone in need of comfort and protection. But to stop the analysis here would be to fall prey to a mirror-image problem. Just because we think one way does not mean that others are like us and think the same. The Bible draws boundaries around the treatment of strangers with regard to debt forgiveness, marriage and ritual: of the foreigner or stranger you may exact [the debt], of your countryman and neighbor you shall not have power to demand it again (regarding debt cancellation in the seventh year, Deuteronomy 15:3); and the stranger that comes close shall be put to death (Numbers 3:10); you shall not eat of anything that died of itself, you shall give it to the stranger that is in your gates, that he may eat it (Deuteronomy 14:21). And what of the refugee? The most obvious starting point are the Cities of Refuge. These are the six sanctuary cities for those citizens and strangers in the Kingdom of Israel and the Kingdom of Judah to escape to when they were accused of an accidental killing. They can seek asylum and avoid the practice of blood vengeance. (Exodus 20-23, Deuteronomy 12-26). Here, a person seeking refuge refers to domestic residents, whether citizen or stranger. Another telling verse directs our attention to a foreign slave (not to those slaves owned by Israelites): “If slaves should escape from their masters and take refuge with you, you must not hand them over to their masters.” (Deuteronomy 23:15) Seeking refuge in Israel from a foreign place implies that the slave came from a heathen nation and would likely adopt Judaism. Thus, both stranger and refugee in the Bible have important contextual limitations. An unconstrained admonition to welcome the stranger appears naive, and more suited to advocacy than to a meaningful analogy between ancient and contemporary society. 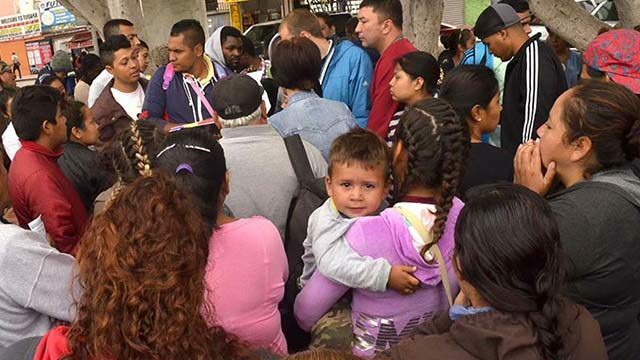 How might Hillel’s wisdom be applied to the Central American caravan headed north to the United States? The UN’s involvement could defuse the situation. It could also be dismissed by those in the caravan as too little as well as interfering with the tactic of a crisis situation. Admittedly, the discussion in this essay will not solve the caravan issue, nor does it pretend that ethical advice could do so. We are bystanders. Bystanders with anxieties. Rather, if we consider Hillel the Elder’s advice, we should “go forth and learn.” There is no comfort in the mantra to welcome the stranger for the phenomenon of mass migration and its consequences is overwhelming. Something much more is needed. That is what our learning must embrace.